Ruthiebear (Titusville, NJ, United States) on 26 March 2017 in Architecture. Stunning perspective, point of view and strong colours ! Great texture and perspective, dear Ruthie! such beautiful composition, perspective, colors & textures! The rust color is simply amazing. I also like that a slight tilt to the horizon line has worked magically here. Nicely described, almost dizzy when you look at pictures :-))))Haleja. Happy Sunday my good friend Ruthie. This is superb ! Excellent point of view !! that does look a bit scary !!!!!!!!!!!!!!!!!!!!!!!!!!!!!!!!! This point of view is unusual. Well done ! Quelle belle prise originale chère Ruth, c'est tout beau! Bise, bon dimanche tout doux et lumineux! Great tones and textures. Now my neck is crinked, I'll turn my gaze downward!! A stunning perspective with an excellent capture of the wood surfaces. The color is especially good. A very successful picture. Fantastic textures and colors. Wonderful capture. Quel rendu et vue quelle compo cette couleur rouille la perspective sueprbe. I like the shot and the treatment. Old and moist, great textures, hope you enjoyed the boat trip. 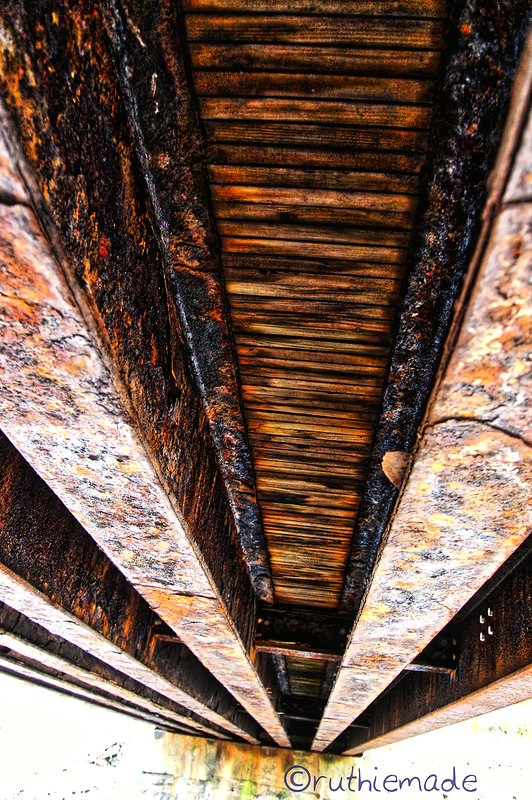 Gorgeous 'rust' textures and a very clever and effective perspective! That is really well done, Ruthie. Wonderful perspective. It makes me dizzy! Fabulous color and textures!